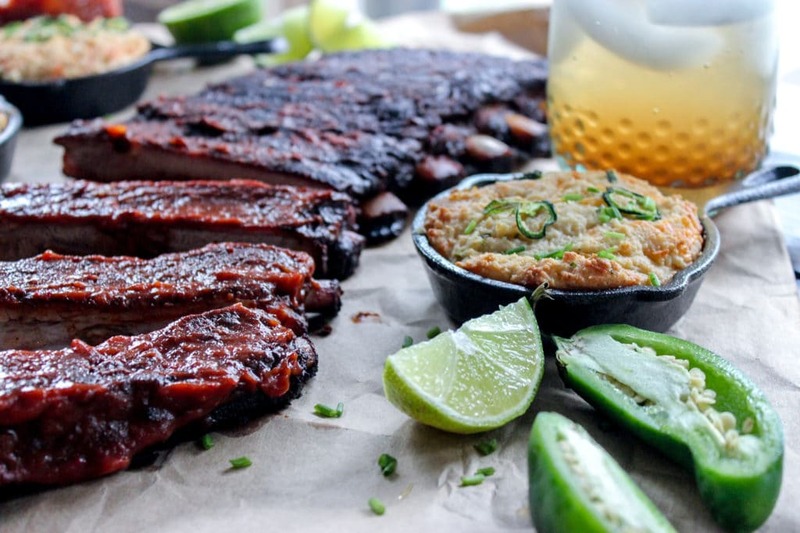 This recipe was made in partnership with Lynx Grills. All opinions are my own. 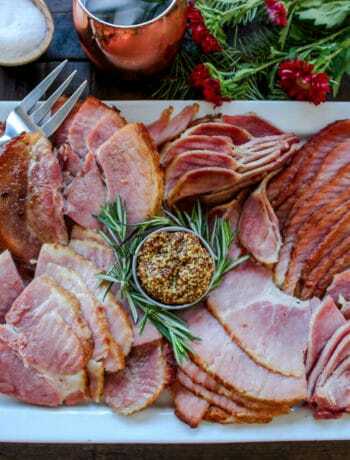 Being born in the midwest, I think it’s safe to say I grew up being a meat and potatoes kinda girl. Breaking away from my roots and living a lower carb lifestyle means swapping out those carby mashed potatoes for creamy cauliflower mash french fries for jicama fries too. I’ve learned to get creative. Trust me. I used to love grilled, thinly sliced potatoes wrapped in a foil packet with butter and onions. The potatoes get crispy and brown on the bottoms and I wanted to see if a similar outcome was possible with radishes. Though they didn’t brown quite as much as potatoes (my guess is the higher moisture content and lack of starch was a contributor), I really did love the balance of flavor here. 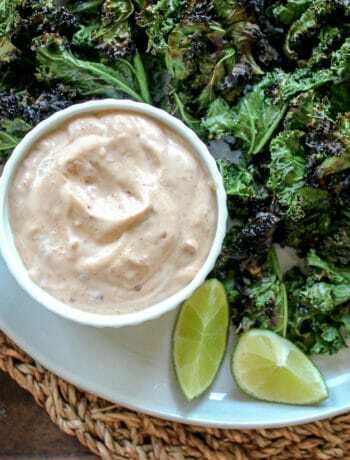 It takes some of that spicy “bite” out of the raw radish and made a really beautiful side dish that was so easy to make! Find the full recipe for the grilled radishes below and read on for helpful tips and tricks. 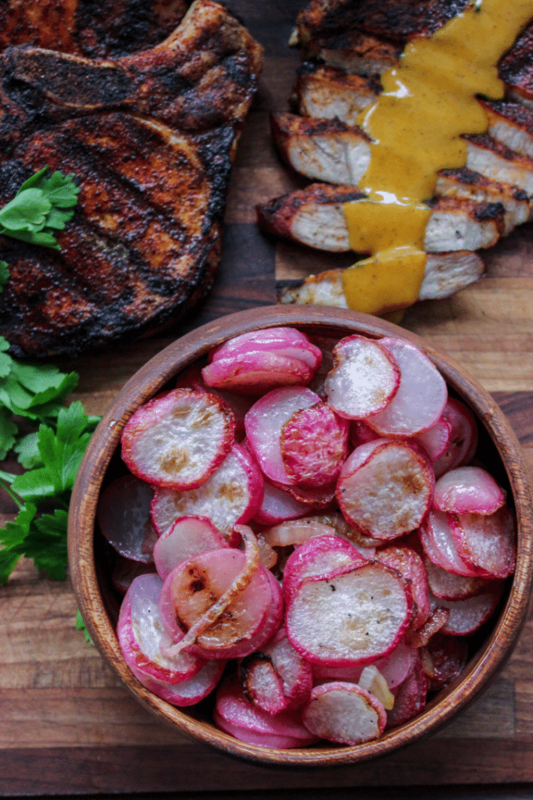 The biggest tip I have for preparing these grilled radishes, is all about the slicing! I prefer to slice my own with a really sharp knife. I find that I have more control personally than when I use a mandolin. If you do have a mandolin, please be careful and use a finger guard! The goal here is to slice the radishes about 1/8th of an inch thick and to get them all even in size. This helps them cook evenly and quickly too. I find grilling these works best when wrapped in a large foil packet. I prefer heavy duty foil and use two sheets overlapped slightly (enough so the middle seam doesn’t come apart) and spray it with non-stick spray. To add flavor to my radishes I added some fresh minced garlic, a few pads of butter, thinly sliced yellow onion, and some of this Smoked Rosemary Sea Salt that my friend Matt shared with me. The smoky sea salt really brought this together! Once the radishes were seasoned and mixed, I laid them out across my foil in a thin layer. Leave enough foil around the sides and edges so that it can easily be wrapped and sealed. This makes it easier for flipping. I set my Lynx All Trident grill (it’s an infrared gas grill) to medium heat. I place the packet over direct heat and grilled for 4-5 minutes. Because the rashies are thin, they don’t need a lot of time. Carefully flip the foil packet to cook the other side (about 3-4 more minutes max). I use really good oven mitts for this or you can use tongs. Remove the foil packet and carefully open the packet to release steam. Avoid having your face or hands right over the opening so you do not burn yourself. If you want some additional browning. you can place them back into the grill open or under a broiler in the oven. 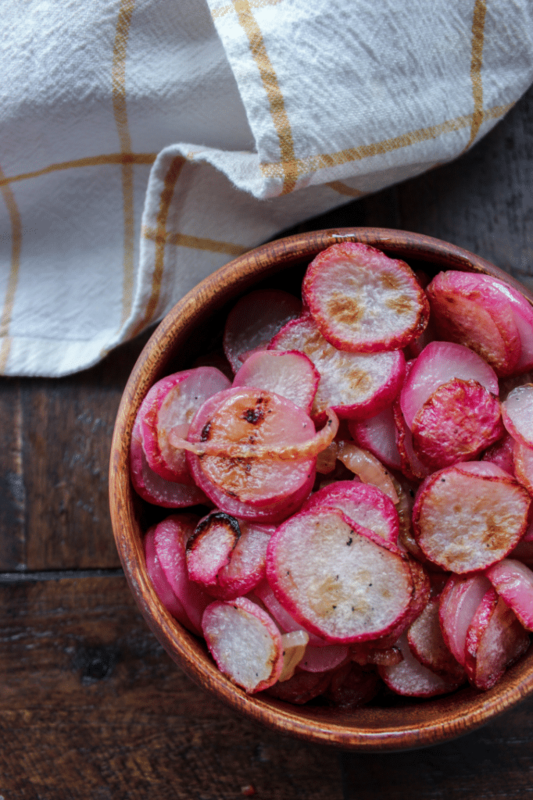 Place the cooked radishes into a serving bowl and serve! 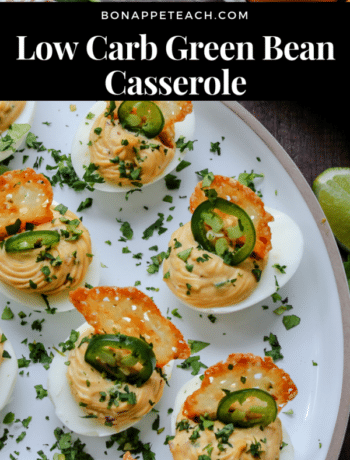 These are a colorful, low carb side that are ideal for easy weeknight dinners, holiday meals, and BBQ’s too! 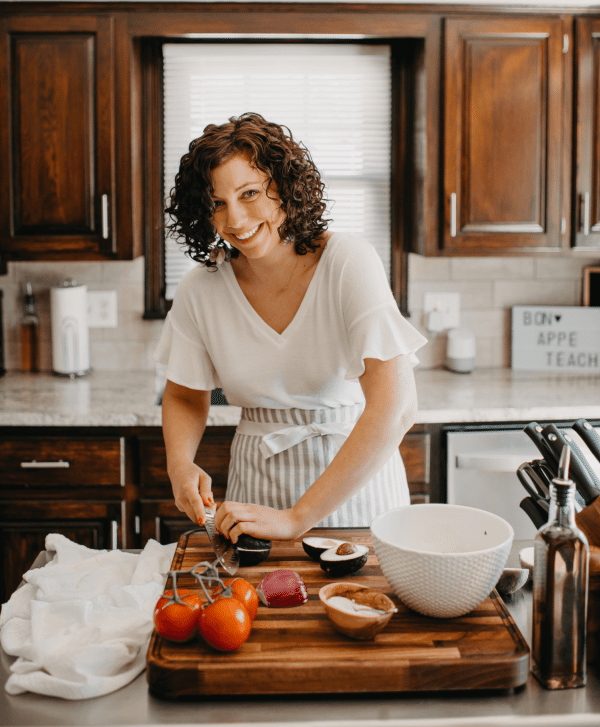 If you’re looking for other great low carb and keto friendly side dishes, check out my popular Keto Corn Muffins too! These savory grilled radish slices are easy to prepare and are a great low carb side dish. 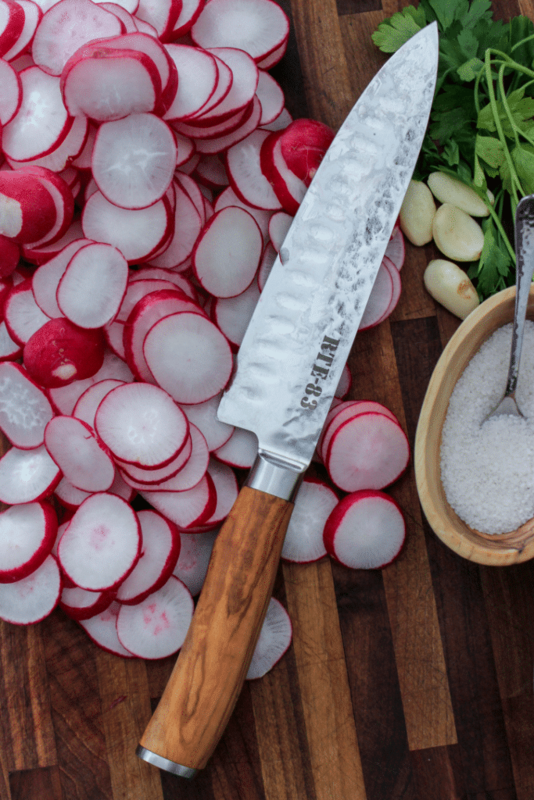 Thinly slice the radishes carefully with a knife or mandolin to 1/8th of an inch thick. Slice the onion and mince the garlic. Take two large pieces of foil and overlap the middle seam. SPray with non stick spray. Season the potatoes with the salt, pepper and mix with the garlic and onion. Spread the mixture out thinly across the foil, leaving a lot of room for the foil to cover and seal the sliced radishes. 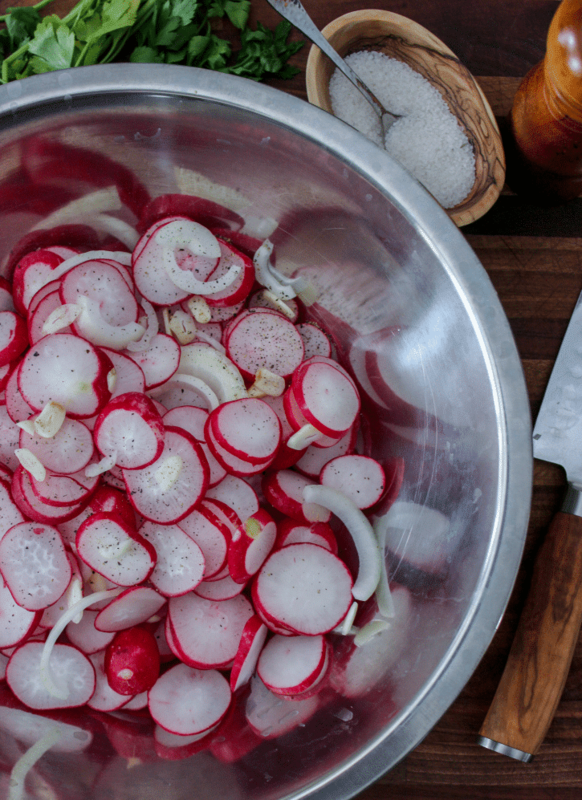 Before wrapping, take the butter pieces and sprinkle them across the top of the sliced and seasoned radishes. Wrap securely. If you would like to brown the radishes a bit more, place them open faced in the foil back on the heat to remove some of the moisture or under a broiler for a few minutes in the oven.